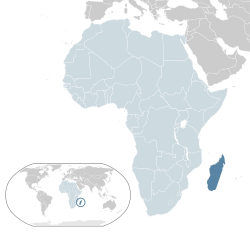 For other uses, see Madagascar (disambiguation) and Malagasy. राष्ट्रगीतम्: Ry Tanindrazanay malala ô! ↑ (फ्रेञ्च्) Le Comité Consultatif Constitutionnel (1 October 2010). "Projet de Constitution de la Quatrième République de Madagascar". Madagascar Tribune. Archived from the original on 24 August 2011. Retrieved 24 August 2011. ↑ २.० २.१ २.२ २.३ "Madagascar". International Monetary Fund. Archived from the original on 31 August 2012. Retrieved 19 April 2012.